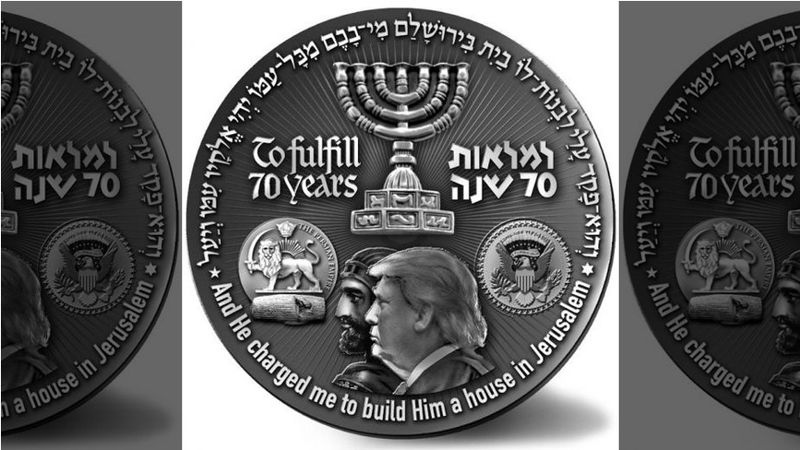 The “Temple Coin” depicts King Cyrus, who allowed the Jews to return to Jerusalem 2,500 years ago, alongside Trump, KOBI reported. The seal of the United States government are also pictured, with biblical verses written in in Hebrew on the face of the coin. On the back is a dove, holding an olive branch in its beak, above a temple. “The coin expresses our joy and gratitude that the American Embassy will be transferred to Jerusalem in honor of Israel’s Independence Day,” the Mikdash Educational Center said on its website. Trump formally recognized Jerusalem as Israel’s capital in December 2017 by directing the State Department to begin the move of the U.S. Embassy from Tel Aviv to Jerusalem. Plans to open the embassy in May were made to coincide with Israel’s independence anniversary. Throughout the 2016 presidential race, the world became intensely fascinated with the prophecies involving Trump and former U.S. secretary of state Hillary Clinton and how a series of seemingly unrelated events—the populist uprising against the globalist elite and an explosion in occult phenomena—align with what prophecy scholars believe is a convergence in end time markers. When the Economist—a prestigious magazine famed for its annual predictions—published “The World in 2017” cover article featuring eight tarot cards, including a Judgment card with Trump seated atop the world, wrapped in an American flag and holding instruments of royal coronation, the oracular cryptogram of Trump’s presidency became what is arguably the paramount question of our time. It is arguable that no other American president has faced such a tumultuous first term in office as Donald Trump. Yet somehow he is still in office and whilst others fall or resign the president shows no sign of wavering especially in regards to his support of Israel. In the past 70 years, no single country's stock has risen faster or farther than the State of Israel. Once a resource-poor, existentially endangered nation-state comprised of refugees from post-Holocaust Europe and Muslim countries throughout the Middle East and North Africa, Israel has emerged into a world economic, military and diplomatic superpower. In just one week, Israel's elevated status is being put on full display, in no small part due to the unlikely and oft-polarizing duo of U.S. President Donald Trump and Israeli Prime Minister Benjamin Netanyahu. While announcing America's exit from the flawed Iran nuclear deal--officially the Joint Comprehensive Plan of Action, or JCPOA--Trump's direct reference to Netanyahu's publication of incontrovertible evidence exposing the full nature of Iran's sophisticated nuclear-weapons program places Israel at the center of policymaking in the free world. Just prior to Trump's speech, it was reported that Israel had briefed at least 22 nations on the full contents of the documents, photos and simulations daringly confiscated by Israel's Mossad, clearly signaling that Israel's intelligence is among the best in world. Following Trump's speech, it became clear that Israel's analysis of Iran's nuclear program and the nuclear deal now defines and supports America's policy. In the hours after Trump announced America's withdrawal from JCPOA on May 8, a large explosion occurred at an Iranian weapons depot outside of Damascus, with reports of yet another alleged Israeli airstrike into foreign territory that penetrated its targets, despite the presence of Russian missile-defense systems in Syria. Just a few years ago, leading up to the signing of the JCPOA in 2015, Israel was a pesky obstacle to the deal that was supposed to be the crowning foreign-policy legacy of the Nobel Peace Prize-winning President Barack Obama. At the time, Netanyahu obstinately delivered an impassioned speech before Congress opposing the deal, angering Obama, the Democratic Party, the international community and liberals at large. Yet with Trump's exit from the deal, which he noted during his speech a few weeks ago "failed to make the world safer," it now becomes clear that Netanyahu's views have prevailed. Jerusalem's position and Washington's position have aligned to dictate a new international policy towards Iran, the world's leading state sponsor of terror.